It is refreshing to have views about Muslims and their creed presented by someone who is looking toward the goal of religious tolerance. A new author calling himself a devout, proud Muslim wants to share with those outside his faith the positive and efficacious aspects of his religion. Ghazi, who is identified only by that name, has created a treatise on certain aspects of Islam that may not be apparent to the average Western reader to whom he addresses his ideas. One important issue examined is the treatment of women; he asserts that Muslim women have had certain rights long before Western women in nominally Christian countries had them. Rights given by the Prophet Mohammed (author’s spelling) to women include the right to vote, to divorce, to maintain one’s own private property even in marriage, and to inherit. He cites data from non-Islamic sources regarding the abuse of women in Western society and contrasts this with women’s status in Islamic society. He talks about the health and religious benefits of fasting, as during Ramadan, and gives examples of how a true Muslim leader would govern, while asserting that there are no “Muslim governments” in the world today. He has special words about Islamic law regarding cruelty to animals, contrasting it fairly with how cosmetics are tested by torturing animals in America, Europe, and elsewhere. The One and Only Face of Islam is short (130-plus pages of very sparse text) and has a plain, generic cover. It contains an index, and begins with a disclaimer: “All interpretations of the Qur’an are approximate.” Those who want to access information about Islam can use this book as a guide, but must be advised that the author’s grasp of English is weak; the book contains grammatical errors in almost every paragraph (examples: “in most Islamic country”; “men approaches women”; “fasting help lower cholesterols”). As with many who seek to promulgate their religion, the author starts from his personal, intuitive vantage point, employing circular reasoning: the Qur’an is correct because it cannot be incorrect, so anything that it proclaims is true. Such statements as “the Qur’an is a book of all times” or “Muslims don’t worship a different god” are not substantial unless examined in the light of other faiths and other cultural histories, and discussed in depth with believers from other spiritual paths. Nonetheless, in a time when Islam is under international scrutiny and often perceived negatively by those who do not follow the faith, it is refreshing to have views about Muslims and their creed presented by someone who is looking toward the goal of religious tolerance. 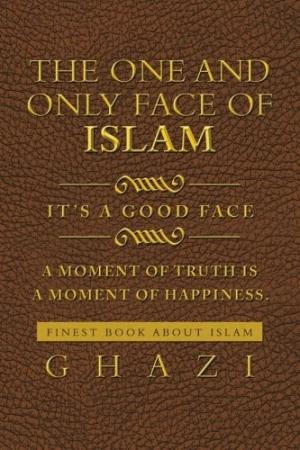 Ghazi is sincere, and the information in The One and Only Face of Islam is worthy of consideration.